Browse this gallery of Order Corallimorpharia, Family Discosomatidae or Actinodiscidae and Ricordeidae photos to view and identify these types of soft corals that are an excellent choice for beginners. Species of these families are most commonly called Mushroom Corals or Disc Anemones, but have other names like Giant Cup, Elephant Ear, Hairy, Frilly, Spotted, Speckled, Metallic, Fluorescent, Umbrella, Warty, Forked Tentacle, and Ricordea. With many colors to choose from, being solid or multi-colored, spotted, striped, or textured, and because they are easy to care for, one can see why these corals are among the most popular with reef aquarists. This are some of the occupants of our 92g bowfront corner tank. See how we set up our 92g bowfront reef tank to see the progress of the tank set up. Due to their tolerance of less than perfect water and lower light requirements, Mushroom corals make an excellent beginners coral. Since they derive much of their nutrition from the water around them, Mushrooms actually prefer dirtier (small suspended particulates and dissolved organic matter) water than many other types of corals, making their care in an aquarium much easier. 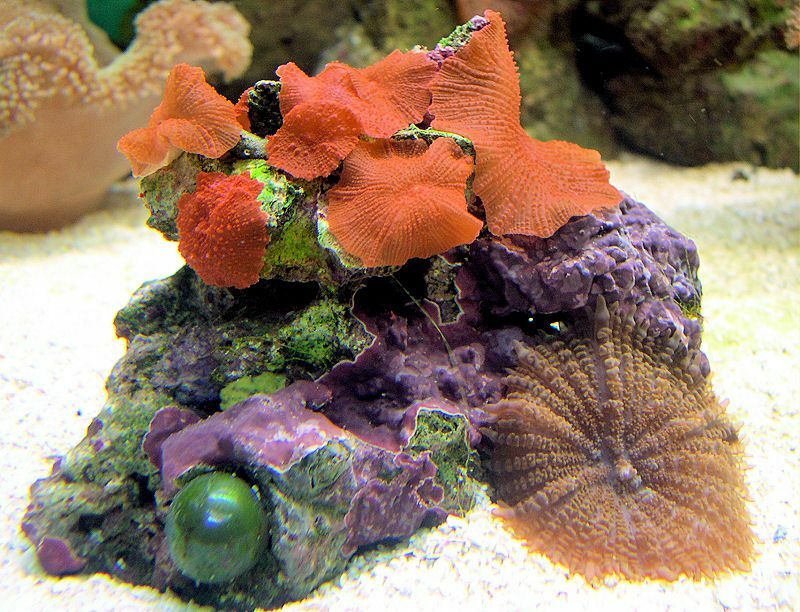 The multitude of Mushroom colors (red, blue, purple, green) make them a terrific addition to almost any marine aquarium. Mushroom corals can be easily purchased either online or at most local fish stores that carry saltwater fish and invertebrates. Not responding well to bright lights or heavy currents, to allow for maximal expansion and reproduction, these corals are best kept under low lighting conditions (fluorescent lighting is ideal) with little water movement. Safe with fish, crustaceans and motile invertebrates, but should not be placed next to other soft and stony corals and sessile invertebrates, because of the detrimental effect they can have on them. How can you tell if your mushroom corals are receiving the right amount of light? Mushrooms that are exposed to too much light will have a tendency to curl up. Mushrooms that are receiving too little light will extend, reaching for the light source and also lose some of their bright colors. Mushrooms that are getting the right amount of light will lay flat on the rock or substrate. Mushroom corals obtain much of their required nutrition from their surroundings as well as from light (the sun in the ocean). Using a highly-developed mucus capture and transport system, these corals derive nutrients by collecting and ingesting particulate matter suspended in the water around them, and from their zooxanthellae. With the right conditions, most Mushroom corals are quite prolific in an aquarium, producing many offspring several times per year if they receive even less than perfect lighting and nutritional levels. Temp. : 76 to 80 degrees F.
Nitrates: As with most corals below 10 ppm is best over time, however mushrooms are quite forgiving and will tolerate much higher levels for long periods of time. Water Flow: Moderate to Low flow but not directed at the Mushrooms. Calcium: Ideal level is 450ppm. Alkalinity: 3.2-4.5 mq/L considered optimum. The Elephant Ear Mushroom Coral is usually is usually brown or green, with a large wavy surface, a leathery texture, and multiple mouths. It can reach 10 or more inches in diameter. These corals display a wide variety of colors, textures, and patterns. Some are solid colors, whereas, others are striped or spotted. Striped varieties are usually green. This type of Mushroom Coral is highly prized by the avid collector and makes a vibrant addition to the reef aquarium. The Rhodactis Hairy Mushroom occurs in many colors including brown and tan, and the more colorful green. Like the name suggests, the surface of these mushrooms are covered with many hair-like tentacles, giving it a hairy appearance. The Ricordea, or Flower Mushroom Coral has short, club, or berry-shaped tentacles. It shares some similarities to stony corals, and is also termed a Disc Anemone. It is found in a variety of color forms, but green is the most common. The Spotted Mushroom (Actinodiscus sp.) corals display a wide variety of colors, textures, and patterns. Some are solid colors, whereas, others are striped or spotted. The spotted ones are usually blue or green with spots. This is a Stony Disk or Mushroom Coral (Fungia scutaria). Other common names for this coral include Plate, Tongue, Fungus, Chinaman Hat , Dome, Helmet, Mole, Neptune's Cap, Plate, Long Tentacled Plate, and Slipper Coral. Ricordea Corals are highly prized in the saltwater aquarium hobby..
A Stony Disk or Mushroom (Fungia sp.) Coral.